We had the Paris Couture Fashion Week full of Lebanese designers’ glam creations. 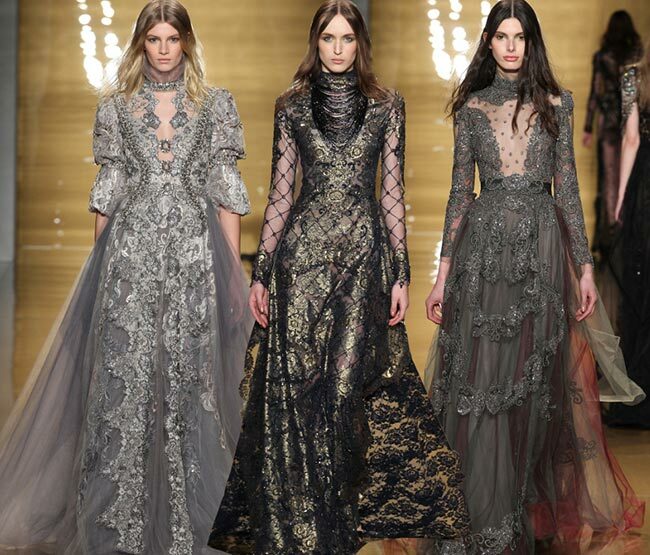 It is an honour to see more of the Middle Eastern inspired artistry appear on the New York Fashion Week for ready-to-wear fashions as well, particularly when we are looking at the incredible Reem Acra fall/winter 2015-2016 collection. She is known for her eponymous brand that focuses on the bridal gowns and the RTW designs, her fame having been achieved newly for the former designs. She is a woman known for paying attention to detail and for always coming up with new and modern concepts that revolutionize the beauty of the distinctive tailoring she is so famous for. The red carpets around the world are in love with her designs, that’s how frequently the celebrities on a global basis opt for wearing Reem Acra outfits and gowns. The inspiration behind a designer’s career is always quite interesting, but when that has to do with buying a vintage dress from a Bedouin that was full of beading and embroidery, we have to really reflect on our own choices in life. Sometimes it is the smallest of things that create the biggest change and that simple purchase in the city of Beirut from a Middle Eastern tribe has left a magnificent print on Acra’s life as a whole. The Reem Acra fall/winter 2015-2016 collection certainly reflects upon those humble beginnings as well, with a short dress with a high neck and fully embraced in silver beading, worn under a blush pink mink coat starting off her incredible collection. 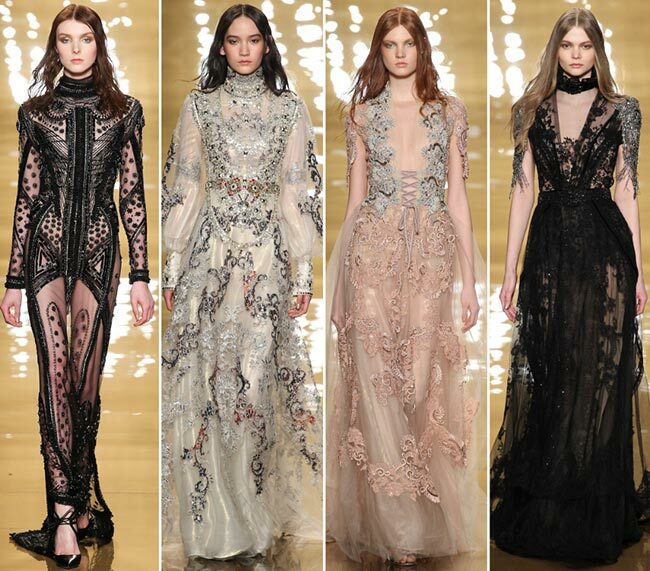 This show seemed like something out of a fairy tale, and was described by the designer herself as simply magical. We couldn’t agree more. Acra has dressed royalty and celebrities alike; that includes Jane Fonda, Halle Berry, Angelina Jolie, Madonna, Jennifer Lopez, Eva Longoria, Tailor Swift, as well as Princesses Haya bint Al Hussein and Ameerah Al-Taweel. There is even a Reem Acra Bride Barbie Doll to be had! Needless to say, this is one Lebanese fashion designer that has made waves globally and won the hearts of Americans at home as well. 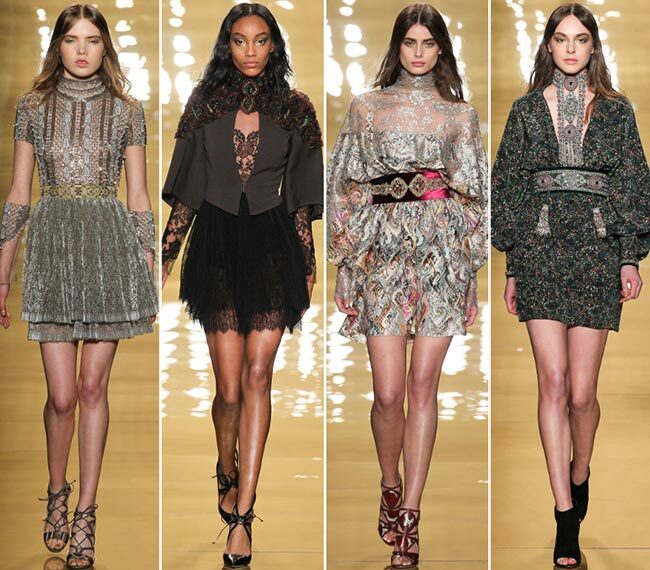 She definitely is one fixture on the runway we cannot seem to get enough of. This collection is 44 pieces long and already being sifted through by those who would wear it for the red carpet events coming up soon enough. Fashion Week did fall in too close to the Awards ceremonies, but that makes the designers stand out all the more with their incredible abilities to dress the best in the movie and music industries with their own creations. Whereas most of the Reem Acra fall 2015 fashion line keeps the hems well above the knees, we find ourselves enamoured by the final 12 pieces, with their organza and silks, the sheer fabrics and the beading, the incredible detailed embroidery ornamentation and the way each dress falls to the floor, wrapping around the legs and the ankles along the way and creating the silhouette of a goddess under it all. From silver and white to grays and black, the peachy blushing hues and the royal reds, this collection has it all. 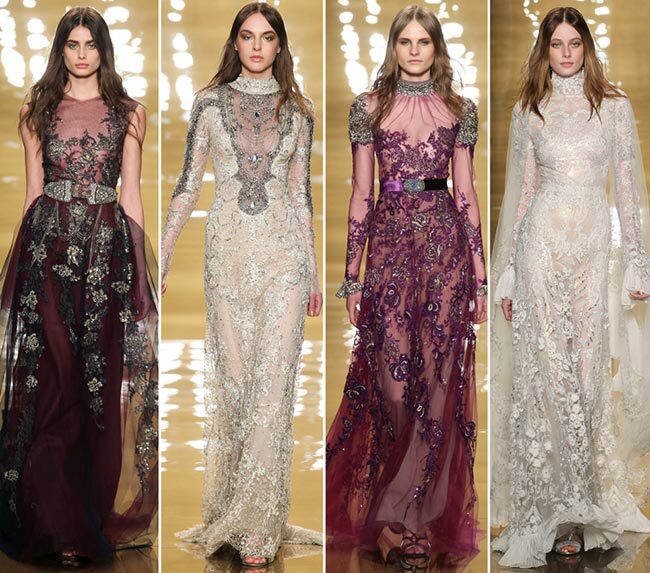 If there is any one designer we would love to fill our closets with, it would probably be Reem Acra.